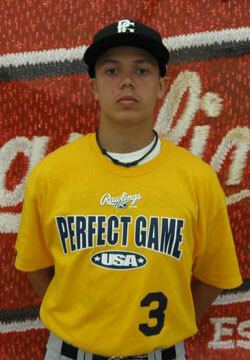 Robert Solano is a 2010 RHP/3B with a 5'10'', 165 lb. frame from Stroudsburg, PA who attends Notre Dame HS. Slender, athletic build. Pitches with a rotational delivery and a long smooth arm action with solid arm speed. Mid to low 3/4 arm angle. Mixed in a slurvey CB with solid spin and a straight CH that he maintained his arm action on. In the IF he showed good arm strength and a quick release. He hit with an open stance at the plate and showed good bat speed. Took aggressive swings in the game. He is a very good student.